(4 May 2017) – Resilience, Community Action and Societal Transformation: People, Place, Practice, Power, Politics and Possibility in Transition is a cutting-edge collection of reporting, theory, commentary and analysis at the interface of research and practice towards community resilience. Its content ranges from first hand accounts of the Transition Movement in the UK, Canada and Spain, theoretical reflections on resilience theory from Transition Network, challenges to accepted ideas of resilience in politics and sustainability, the shifts in mindsets and perspectives required for transition, and post-colonial perspectives on Transition. 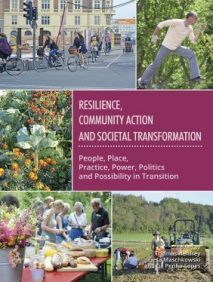 The book is the second in the Community-Led Transformations series (following Permaculture and Climate Change Adaptation in late 2015), an ongoing partnership between ECOLISE and Permanent Publications. Compiled and edited by Tom Henfrey, Gesa Maschkowski and Gil Penha-Lopes, it emerged from collaboration among Transition Research Network, FFCUL, Schumacher Institute and Transition Network. You can order the book at Green Shopping.